Proselect Empire Dog Cage - Why its Tough & Good Value for Money? Proselect Empire Dog Cage is awesome. You can click the image to read reviews on Amazon. Proselect Empire dog cage is a strong cage which is ideal for medium to large dogs that suffer from severe separation anxiety. Its strong build makes it almost impossible for the dog to chew his way out. Though the cage is on the expensive side, it is definitely value for money for pet parents who find it difficult to contain their dogs in wire or wooden cages. + The cage is very sturdy and can even keep the most aggressive dogs safely inside. + The steel cage is quite long lasting and durable. + It is easy to clean the cage because of the grates and sliding tray. + Even though the cage is quite heavy, the detachable wheels help to move it easily. + You can easily assemble the cage with the help of some simple home tools. – The latches are not very doggy proof and some customers have reported their dogs opening them after some tries. A lock will definitely help such pet parents. – The cage is not entirely rust proof. After being exposed to water or after constant chewing by the dog, it starts corroding at certain places. – You cannot fold the cage and hence it is not suitable for travelling. Let us have a look at its various features and find out how it is different from other cages in the market. The heavy duty steel cage is quite sturdy and very difficult to bend, even by strongest of dogs. Though the bars are hollow from the inside they do not break easily. A very determined dog might be able to bend them a little but it will require lots of strength and persistence. Most customers have reported that their dogs give up after a few attempts and then sit quietly inside accepting defeat! The Proselect Empire dog cage has a grated design which makes it quite airy and comfortable for the dog. You can always put some mat or blanket at the bottom to make it more comfy for your dog. There is also a sliding steel tray below the crate that helps to keep things clean. The grates make it possible for any food or waste to drop on the steel tray which you can take away for cleaning. The crate has four detachable wheels which can be locked. The wheels help with the mobility and their locking mechanism provides extra security. The crate has a front door through which you can let your pet out and also provide food and water through it. There are sliding latches that will help to lock the door securely. The product comes with step by step installation instructions which are easy to follow. You can set up the crate by yourself quite quickly. Those who find it a little difficult to install it can always take professional help to set it up correctly. 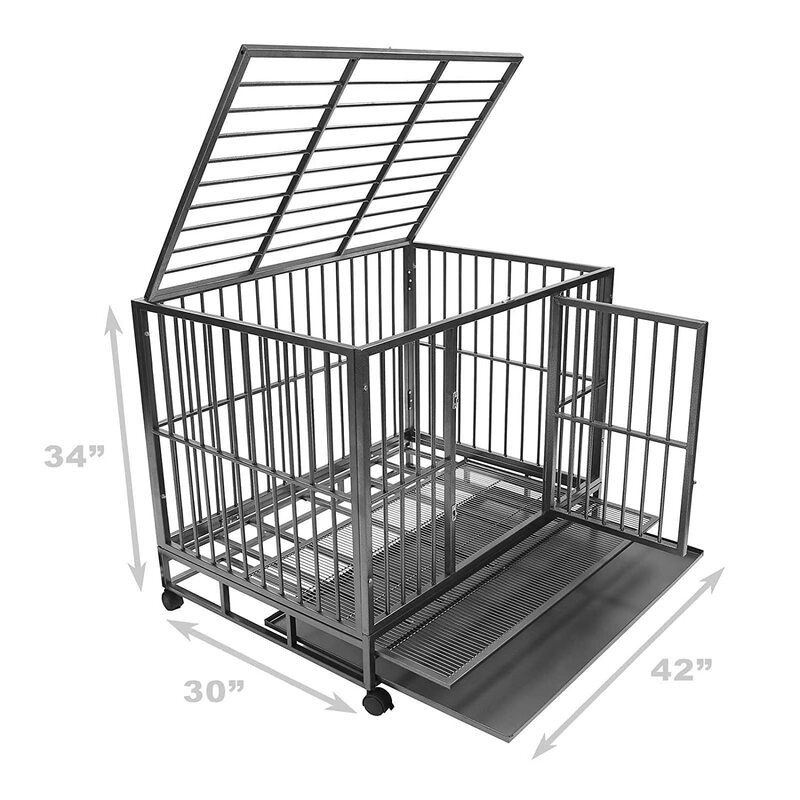 The Proselect Empire dog cage interior dimensions are 40¾”L x 28⅛”W x 31¾”H for the L size cage and 35.75” L x 23.5” W X 24.5” H for the M size cage. Looking at the dimensions you can guess that they are quite roomy for large and medium size dogs. The dog can easily sit, stand, move about and sleep inside the cage. In fact some customers have even complained that the cage is too roomy for their pets and have requested the manufacturers to come up with an S size cage. The cage has steel tubing and welding at stress points. and the inner dimensions are 40¾”L x 28⅛”W x 31¾”H. 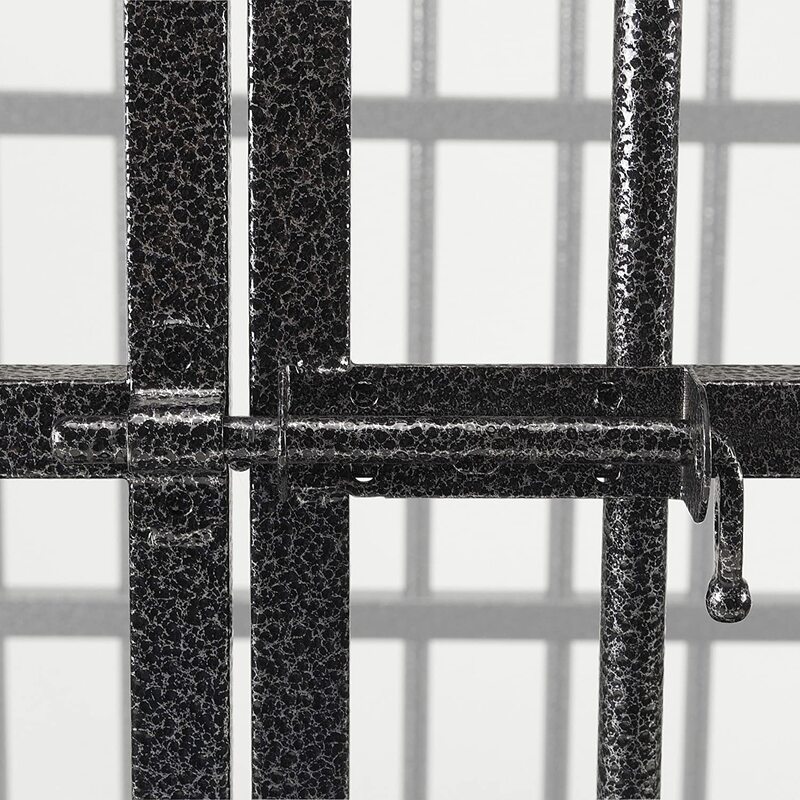 The cage is made of durable and rust resistant steel. There is a steel tray and 4 removable castors with the cage. The cage can hold medium to large size dogs weighing up to 150 lbs. The weight of the cage is around 99 lbs. You can lock the cage through its two sliding steel bolts. Most of the buyers of the Proselect Empire dog cage are extremely satisfied with their purchase and are happy that their dogs are unable to break or bend the cage. Knowing that their dogs are safe inside the cage and are not destroying furniture of the house in their absence, has made it much easier for pet parents to leave for work peacefully. Though some customers have reported rust problems and welding issues, they are satisfied with the overall strength and sturdiness of the cage. 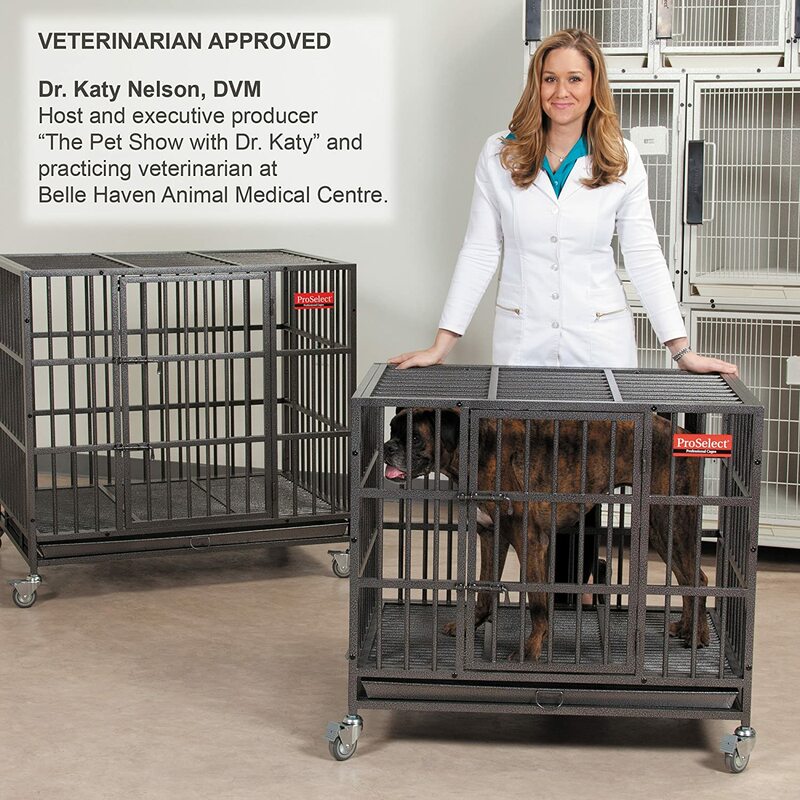 They find the cage ideal for dogs that suffer from severe case of separation anxiety. The cage holds them well and even if the dog makes attempts at escaping he gives it up after a few tries. SmithBuilt Heavy-Duty, you can click on the image read review on Amazon. When you look at Proselect dog cage and Smithbuilt dog crate you will hardly find any difference in their design. They both look very similar in size and shape and apart from their cost you will find it difficult to spot any other difference with a naked eye. Hence, here we will step in and try to help you find out which one is more value for money. Let us start with the similarities between the two cages, which are quite obvious. Material: Both the cages are made of steel. The quality of steel we will discuss later on. Design: The cages have a grated design and a sliding tray beneath for easy cleaning. Both cages have 4 wheels with locking mechanism. Size: Surprisingly, the size of the cages is also quite same. There is just a couple of inches difference but other than that both the cages will be able to house same breeds of dogs. 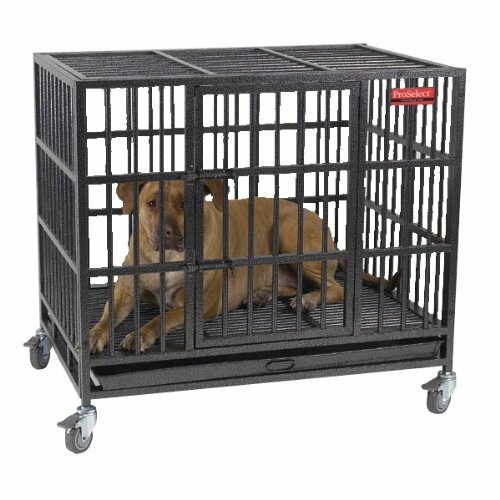 Weight: The weight of Proselect empire dog cage is 99 lbs whereas the weight of Smithbuilt dog crate is 80 lbs. And this weight difference brings us to the dissimilarities between the cages and the cause of it. So let us now focus on what are the things that make both the similar looking cages different. Quality: Though both the cages are made of steel, which one is a heavy duty steel can be gauged by its weight. We know that steel does not bend or dent like aluminum and it is also denser and heavier than aluminum. You will notice that though both the cages have similar sizes one is lighter than the other. Hence you can easily conclude that the heavier cage is actually of a stronger metal than the lighter one. Here, the Proselect cage is heavier and it will not be easy to break or bend it. That is why you will find fewer complaints against it. There might be complaints regarding welding or wheels getting off, but mostly customers vouch for its strength. Their dogs have not been able to break or bend the cage which definitely makes it a good investment. The percentage of dogs breaking or bending the Smithbuilt dog crate is much higher. And thereby lies the proof of its poor quality. Poor quality material results in a poorly made cage. Design: There is a minor difference in the design of both the cages. The Proselect cage has just one front door whereas the Smithbuilt cage has one front door and one top door. Though this can prove a plus point for the Smithbuilt cage because of the benefits offered by a top door (like placing a mat or proving food) the poor latching mechanism of the door has turned it into a headache. A bigger dog will be able to reach the top door and open the latch. Front door latch has been opened by many dogs and it will come as no surprise if a dog finds out how to open the top latch too. Another problem reported by a customer is that the top door of the Smithbuilt cage is heavy and therefore should be opened with caution to avoid any personal or cage damage. Cost: The Proselect empire dog cage is on the expensive side whereas the Smithbuilt model is more budget friendly. But for those who are looking for a one time investment then they will do better to buy the Proselect cage. Especially if you have a dog that has separation anxiety and will try anything to break free. Proselect empire dog cage is an ideal cage that keeps medium and large dogs safely inside its strong steel bars. This cage is especially suitable for dogs that like to try every trick in order to escape. With this cage the dog will give up after a few tries and will stay peacefully inside. There is another metal dog crate called ‘Walcut Dog Crate‘ which I really love.